Well, dear readers, as I promised in this week’s Game of the Year announcement, Dice Hate Me is proud to offer a very special holiday giveaway in celebration of our awards. 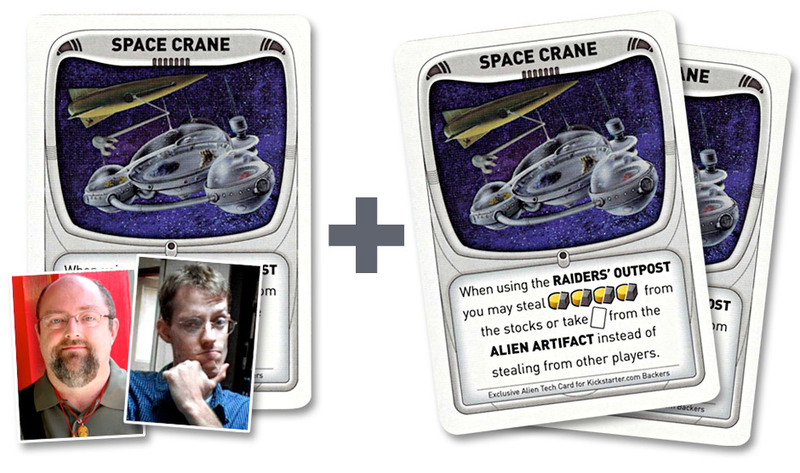 Since Alien Frontiers has been awarded the medal, we figured what better way to commemorate the occasion than to reward one special gamer with a very rare treat: the Space Crane Alien Tech card! That’s right, Dice Hate Me, in conjunction with Clever Mojo Games, is proud to offer not one but three of these rare Alien Tech cards, unavailable for purchase anywhere. The Space Crane card was produced as a promotional for backers of Alien Frontiers on kickstarter.com and will not be offered again. This is your chance to win one Space Crane signed by Clever Mojo Games owner and publisher W. David MacKenzie and Alien Frontiers designer Tory Niemann. The winner of the giveaway contest will also receive two additional Space Crane Alien Tech cards to use when playing Alien Frontiers! There are three ways to enter the contest. Each method below will grant you one entry, so do just one or go for all three! 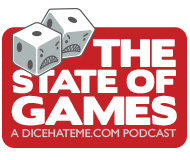 Head over to the Dice Hate Me Facebook page and click on that friendly “like” button. Don’t worry, if you’ve already “liked” Dice Hate Me on Facebook, you’re already entered into the drawing. Subscribe to Dice Hate Me. I promise not to bombard your inbox with useless mail; the Dice Hate Me newsletter is only sent out when there is new content on the site, or an exciting giveaway like this one. That means, on average, one email a week. Comment to this article and tell me what game(s) you’re looking forward to or would really like to play in 2011. They don’t have to be games that will be coming out in 2011 – anything is fair game! All entries must be submitted by 11:59 p.m. EST, Monday, January 3rd. The winner will be announced on Wednesday, January 5th. It’s just that simple. Enter today, spread the word, and win some Space Cranes. Oh, and Happy Holidays from Dice Hate Me! I was looking forward to Fresco (which I’m hoping Santa brings me). But after your article on games of the year, I’m now eyeballing Shogun and Alien Frontiers. Personally, I am looking forward to the second expansion to Cosmic encounter: Cosmic conflict, the upcoming expansion to Cuttroat Caverns: Fresh Meat, and also (of course) the second printing of Alien Frontiers. I’ve only played 7 Wonders and C&C: Napoleonics once each, but I want to play both of them a lot more. For “new stuff”, though, Alien Frontiers obviously tops my list. Other games would include Survive!, Wok Star, Troyes, London, Star Trek: Expeditions, The Ares Project, the new Sid Meyer’s Civ board game, Two by Two, Die Burgen von Burgund (the new Alea game, hopefully in English soon), and Letters from Whitechapel. I’m looking forward to get a copy of Troyes. Looks like a great game, but haven’t been able to find a copy in the US. Same with Interstellar Mayhem. I am looking forward to [Illuminati Removed] it should be awesome. Joking aside Steve Jackson has a few things in the Munchkin Pipeline I am really looking forward to and also sitting down to my first Frag game in a long time. Need to get the Gold Box. GeekInsight – My BGG Secret Santa recipient wanted Fresco, but I opted for something else. It looked interesting when I saw it in the store the other day. I’ll check it out! Ben – Oooh, Cosmic Encounter expansion! Now you’re talking! Justin – Never heard of Interstellar Mayhem – I’ll have to check into that! Scott – Bah! You Men in Black and your secrets! Well, whatever it is, I want to play it. And buy it. And hold it over my head like like He-Man’s power sword. I’m looking forward to playing some good ol’ fashioned Egyptian Rat-Screw. Drunkenly and without much thought at all! Oh, Sally… that’s far too cheap to make the list. Of course, I guess that depends on the alcohol… you buy the booze, I’ll get the cards. I’m really looking forward to having EMINENT DOMAIN from Tasty Minstrel Games in my hands in 2011. I was a kickstarter sponsor of the game so I got to name a planet card. That’s incredibly exciting because I named a planet after a group of students I used to live with at a boarding school. I’m also eager for the following new games coming out: the Z-man release of TROYES, the new Richard Garfield game KING OF TOKYO, super excited to try and get a copy of ESCAPE FROM THE ALIENS IN OUTER SPACE, and maybe even YOMI from Sirlin Games or JAB: REALTIME BOXING from Tasty Minstrel to play with students. To be fair, I also really want to try HAMMER OF THE SCOTS as a venture into new territory for me. Yes, it’s shameless, but despite not having a copy of the game (yet) I’d love one of the cards. I’d frame it and everything! I’m dying to play Navegador, Grand Cru, and 1860, but most of all, I’m looking forward to playing production copies of the games that I’ll be publishing! 7 Wonders is one of the new games I want to play. I just tried a learning game of BattleStar Galactica and I am eager to give the full game a try! Still looking forward to Civilization, it’s waiting for me at home when I’m returing before New Year’s Eve. Also wating for Lords of Vegas to be released here (in Norway) and of course the reprint of Alien Frontiers so that I could use these cards if should be lucky enough to win them! I’m hoping to check out famiglia (by rio grande), merchants and marauders, and alien frontiers. They all sound pretty cool. Just became father, so the ‘ collect all cool kids games (Haba)’ has started. I must be ready in about 3/4 years…. Chris – I’m looking forward to Eminent Domain, as well. I’m a fan of Tasty Minstrel. That’s awesome that you got to name a planet! Wish I had jumped on that wagon while there was time. Thanks for subscribing! Michael – There’s no shame in wanting something free and totally awesome. I’d frame it, too! Tim – Navegador looks interesting; I’ll have to check out your games! Rob – Yup, 7 Wonders is on my list, for sure. I should have bought a copy for myself as well as for my Secret Santa! Kristian – If Civ the board game is as good as I remember, and half as good as the computer games, I’ll be hooked. Josh – Merchants and Marauders… YES. It looks like a lot of fun. Twilight Imperium of course. I am always ready to play this game. But I have never time enough so that I could do it. The game I’m most looking forward to playing? I think that would have to be the new FFG Civilization game. I love the computer games and am very curious to see how the board game feels. I’m looking forward to getting some of my unplayed games off of the shelf – Labryinth, Power Struggle, and Stronghold at the top of the list! The games I am looking forward to play in 2011: 7 Wonders, Troyes, Eminent Domain (I have a planet named after me! ), Alien Frontiers (pre-ordered), Cyclades (ordered) and Carson City (ordered). Mkal – Time is a tough commodity, but it’s so satisfying when you can make time to play Twilight Imperium. Brenden – I’m the same way; I’ve been a fan of the computer game for so long, I’d love to give it a shot on a board. Darren – Stronghold! I want to try that. Kash – Great list! I’m pretty sure I want to try all those games, as well, especially 7 Wonders, Carson City and Eminent Domain. Maryanne – Ahh, Scotland Yard. My old friend. I really need to get a new copy – I’ve been itching to play that for years. Well there’s Eminent Domain on the way, as well as my portion of the second printing of Alien Frontiers. Also, I picked up Castle Panic over the holidays but haven’t gotten it to the table, so I look forward to breaking it in sometime in 2011. Besides that, I’m mostly excited by possibility. There are games I don’t even know about yet that I’m just going to stumble upon and love. Isn’t that what’s most enjoyable? Ah, Castle Panic – I want that game. And I agree – the stumbling process is one of the best things about gaming!